ATLANTA (Updated July 23, 2015) – Chick-fil-A® announces that Jeannette McNeil Cathy, the wife of its late founder and chairman emeritus, S. Truett Cathy, died at 8:55 p.m. Wednesday, July 22, 2015 at the age of 92. Cathy passed away at Piedmont Atlanta Hospital surrounded by her loving family. 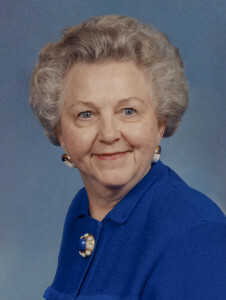 Matriarch of one of the nation’s largest family-owned companies, Cathy played a key role in her husband’s business achievements, helping him nurture the Dwarf Grill (later renamed the Dwarf House), which he started in 1946, and launch the Chick-fil-A brand in 1967. Yet perhaps Cathy’s most significant role has been as influencer and nurturer of her family’s faith. Born Jeannette McNeil in 1922, Cathy grew up in Atlanta, where she first met her “childhood sweetheart” Truett Cathy when he was eight years old. As a young adult, Cathy attended New Orleans Baptist Theological Seminary at a time when not many women were afforded the opportunity. Her marriage to Truett Cathy in 1948 thrived for 65 years. Truett Cathy, who predeceased his wife in 2014, long credited her with strengthening his own faith, which helped shape the way he conducted his life and business. Basing his company’s business model on biblical principles, all Chick-fil-A restaurants—without exception—operate with a “Closed-on-Sunday” policy. Jeannette Cathy is also credited with inspiring many of the philanthropic efforts that are today part of the Chick-fil-A legacy. The Jeannette Cathy Children’s Center, a childcare facility located on the Chick-fil-A corporate campus that is available to home office employees, opened in July 2001 and is dedicated to the woman whose love for children inspired its creation. The center continues to expand to meet a growing need. She and Truett Cathy share credit for the development of the WinShape Foundation and WinShape Homes® , a long-term foster care program serving more than 500 foster children through 13 homes in Georgia, Tennessee and Alabama. Cathy was a dedicated mother and grandmother to sons Dan T. and Donald M. “Bubba” Cathy; daughter Trudy Cathy White; 12 grandchildren and 20 great-grandchildren. In lieu of flowers, the Cathy family has asked that donations be made to WinShape Foundation, which Jeannette and Truett Cathy founded in 1984. The Foundation was created out of their shared desire to “shape winners” by strengthening families and helping young people succeed in life through scholarships and other youth-support programs. Donations can be sent to WinShape Foundation, 5200 Buffington Road, Atlanta, Ga. 30349. A celebration service is planned this Saturday, July 25 at 11 a.m. at First Baptist Jonesboro. The service will be closed to media.